Looking for a Nissan NV200 ladder rack that can handle a 28′ long ladder? 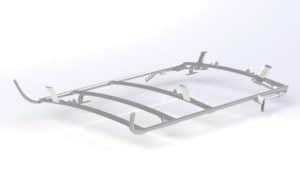 We have just launched the NSX Ladder Rack for your Nissan NV200 cargo van. The NSX was engineered to maximize your efficiency and designed to take you further. With the capability to carry 28′ ladders it is tough enough to take on the big jobs. Quiet: Aerodynamic design ensures minimal wind noise. Safe: The ladder only touches plastic (does not rub against metal) while clamped on the ladder rack. This leads to a longer life of the ladder with less chance of fiberglass splinters. View the full range of products we offer for the Nissan NV200. Check out our full range of Ladder Racks. Find your nearest Ranger Design dealer to order your NSX Rack.